In the past, I've worn ultra lightweight flats for half-marathons and shorter races. However, when I signed up to do a marathon, I decided that the 3.9oz Adizero PR just wasn't going to cut it. Whatever time I saved from using a lighter shoe would be negated tenfold by foot fatigue. I needed a little bit more shoe underneath me. I briefly considered the Brooks T6, but eventually decided something with a slightly less aggressively curved last might be a better idea. I did a whole bunch of searching and trying on various shoes, and eventually ended up with the Nike Zoom Streak 3 (not to be confused with the Nike Zoom Streak XC 3). The Streak 3 is another shoe that I've mentioned in the past, but felt it was deserving of a full review. Before we actually get to the meat of the review, I want to apologize for the poor picture quality. My computer decided to die last week, and somehow that led to me using my phone to take pictures. 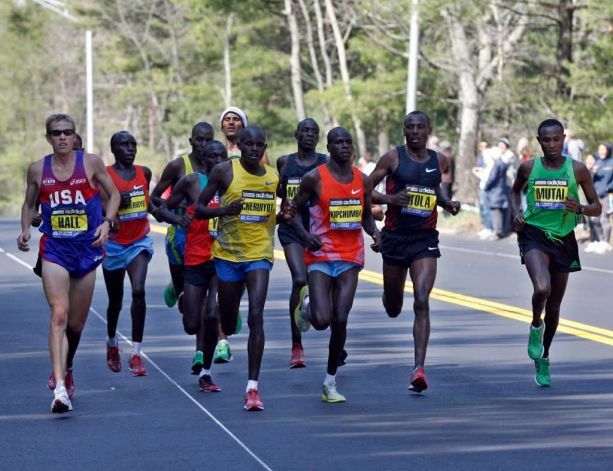 Look at that photo from the 2011 Boston Marathon and tell me what you see. As far as shoes go, it looks like Christmas, because there's a lot of red and green in that picture. The green shoes are the Adidas Adizero Adios, and the red shoes are the Nike Streak 3. While it can be argued that this simply means Nike and Adidas sponsor a lot of top athletes, it also needs to be remembered that Nike and Adidas have two of the most extensive lines of flats. With Nike offering the Lunaracer, LunarSpider R2, Mayfly, Streak XC 3, and Streak 3, and Adidas offering the Ace, Adios, Feather, Rocket, and possibly Pro (is that still around? 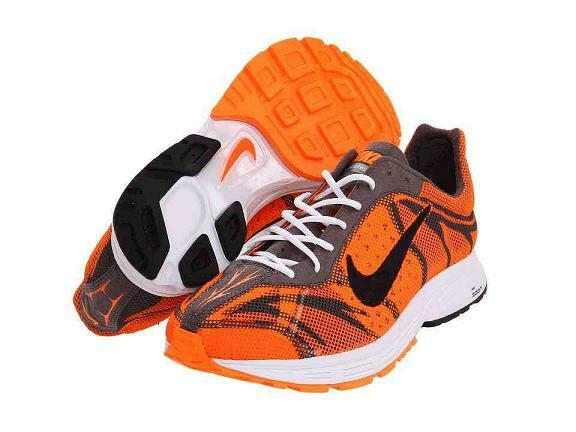 ), neither company has any lack of variety in their line, and more than one shoe in each line is suitable for the marathon. Yet everyone seems to choose the Adios and Streak 3. What is it about the Streak 3 that makes it such a popular marathon shoe? The Streak 3 is a minimum feature, minimum neutral shoe designed for racing. It is built with a curved shape. Zoom Air is located in the heel and is a low-profile air unit with encapsulated tensile fabric for responsive cushioning. Cushlon LT is a full-length midsole foam that delivers plush, resilient cushioning. TPU Shank is located at the bottom of the midfoot and is a thermoplastic unit designed to improve heel to toe transition. Open Mesh is a lightweight, one-piece construction engineered for breathability and water drainage. Microfiber Synthetic overlays are internally located in the forefoot to further lock down the upper for a snug fit. Slip Lasting involves wrapping and stitching the upper in a bootie-like shape before it is glued to the midsole to increase flexibility and decrease weight. BRS 1000 carbon rubber is located along the heel for durability. Duralon blown rubber is located in the forefoot under the metatarsal head area for improved cushioning. Hello, curved last! You can also sort of see the small thermoplastic shank in the arch. The Streak 3 is the spiritual successor to the Nike Zoom Marathoner (there was no Streak 1 or 2, though the Streak 3 was introduced when the Streak XC 2 was on the market EDIT: I have just been informed that there was a Streak 1 and 2 a while ago, not just the Streak XC and XC 2). At 6.7oz for a men's size 9, the Streak 3 is light for a marathon flat, weighing less than the Adidas Adizero Adios, ASICS Gel Hyper Speed, Brooks Green Silence, Mizuno Wave Ronin, and New Balance MR1400. 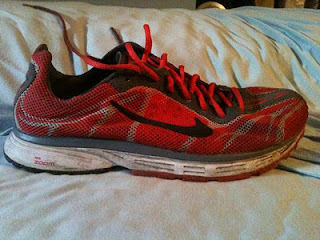 It has a breathable mesh upper and a relatively responsive ride, much moreso than its softer counterpart, the Lunaracer. According to Running Warehouse, it has a 28mm heel and 18mm toe for a 10mm heel-toe differential. Like many flats, it's relatively narrow and hugs the foot, though the toebox is roomier than that of the T7 (since I tend to always use that flat for comparison). I actually found the upper baggy in the toebox area, but my feet are pretty narrow. On the other hand, the heel cup is narrower and keeps my foot in place well. The Streak 3 has a surprisingly curved last for a marathon flat. It's not curved to the extent of the T7, but I was expecting something a lot straighter before I actually saw the shoe. It does give it a pretty fast feeling though. The Streak 3 offers a tiny bit of lateral stiffness for support. There is a very thin plastic shank across the arch to offer a little bit of inherent stability and aid with a faster transition. However, that's about it as far as support goes, and most overpronators will probably want a little more shoe underneath them for a marathon (though this may be a good option for them for 5K and shorter races). 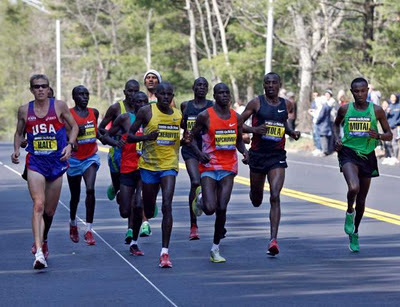 It's probably important to decide whether you want a flat for a marathon too, and part of this is dependent on how long you plan on being out there, but that's a subject for another post. Additionally, the Streak 3 has no real heel counter, and therefore does not offer rearfoot support in that form. It doesn't have the absolute most flexible forefoot of shoes that I've worn, but still feels more than flexible enough while running. 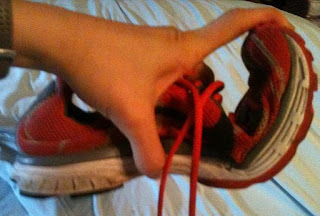 Less lateral flexibility than some of the real minimal 5K-10K flats, but more than adequate for most people's purposes. The Streak 3 doesn't really have a heel counter at all. I don't know why all of my flats looks like they flex in weird places when I bend them like this. They flex normally when being used the way they're supposed to though. These shoes are durable! The Streak 3 made it through my entire marathon training segment, where I used them for every single one of my speedworkouts (usually twice per week, ranging from as short as 3 miles on the track to over 10 miles on the roads...yes, I should have done further than that at marathon pace, but I had no clue how to train for a marathon), as well as the marathon itself, and they show virtually no signs of wear, other than being dirty. 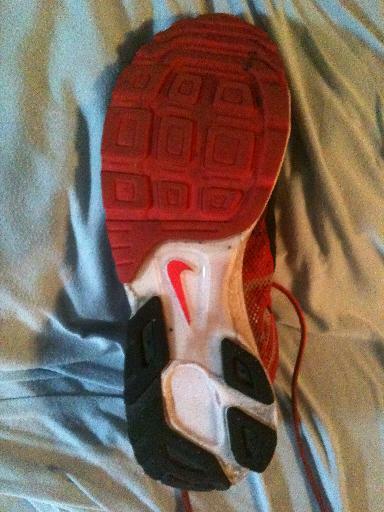 There's very little outsole wear, and the midsole cushioning is every bit as good as when I got them. I'd expect them to make it through another training cycle, at an absolute minimum. The Zoom Air unit in the heel makes this shoe suitable for heelstrikers, but it also seems to work very well for midfoot and forefoot strikers, as evidenced by the many of the slow motion videos I've watched. Honestly, I don't believe it favors either type of runner, and your footstrike shouldn't be used to determine whether or not this particular shoe will work for you. Traction is very good both on pavement, wet pavement, and on dirt roads. It's not a great mud shoe, but then again, it wasn't really intended to be. I'm torn on the upper. It's super breathable and my feet definitely do not overheat, but it's not quite as comfortable as the softer (though less breathable) mesh that is used on some of my other shoes. It's not quite as glove-like as some of my other shoes, and is a little baggy in the forefoot (but again, this is partially because I have narrow woman feet and it's a unisex shoe). I did not have any issues with the upper and not wearing socks for the marathon though. I did end up with some blisters on the soles of my feet, but that's probably because I was stupid and decided not to wear socks for a marathon in 85 degree weather, even after seeing Brian Sell's video of him post-marathon with his blood-soaked shoes. Duh. To be fair, my shoes were not nearly as gnarly as his. Also, the upper (as well as the cushioning) do a very good job of draining and don't retain very much water, a definite plus on rainy days, as well as on hot days when you're sweating a lot or dumping water on yourself, since they don't add tons of weight from being waterlogged, and the water that is there dries pretty quickly. These laces are terrible. 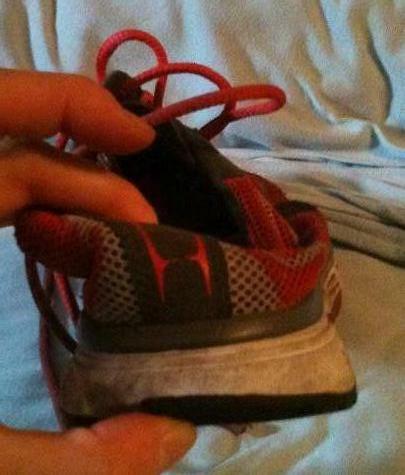 If you do decide to get this shoe, replace the laces. 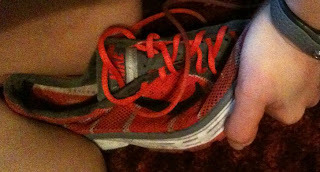 I double knotted them and tucked them into the laces further towards the toe, and they still came untied somewhere around mile 15. I had some issues with this during workouts too, but thought the tucking the ends into the part where the laces cross fixed it. Apparently not. However, props to the shoe for not actually loosening much, and between the heel cup hugging my foot and the laces only loosening slightly, the Streak 3 did a good job of staying on my foot for the next 11+ miles, despite being untied. The Streak 3 is a great shoe for the fast, biomechanically efficient marathoner, as well as for a neutral or even mild-overpronator looking for a short distance shoe with a little more substance to it. Overpronators and supinators looking for a marathon shoe may want to look for something with more support or more cushioning (respectively), and runners who are going to be out on the marathon course for a longer time may want a little more shoe underfoot to help ward off foot fatigue. The Nike Zoom Streak 3 retails for $85 and can be purchased on the Nike Store website, as well as other select dealers and websites carrying Nike running shoes and flats. Sizing is unisex, and they seem to run large, so expect to order between a half and a full size smaller than you usually wear. Full disclosure: I bought the Streak 3 myself, so there is nothing to disclose. The opinions expressed in this review are mine and based on my experience, and do not reflect the opinions of Nike or anyone else. I just got a pair of these via online purchase, and plan to get a few more since they are closed out. They have a fit unlike any shoe I have had before (that's a compliment)- usually I have to go up in size with racers due to my Neanderthal wide forefoot, but this one is true to size, or even 1/2 size large (I will know for sure, when I receive my 10.5s, as opposed to my usual 11 in Nike training shoes). Toe room is something that I value, and is rare in the Nike brand that I favor. Lunarglide+ 2 series was the same way, surprising amount of toe box room. Glad to hear they worked for you! I've heard rumors that fit on the new version will be changed, but can't 100% confirm. Are you sure those shoes are Streak 3? They sure do look like the Streak XC 3 which are also red. I am just wondering how come those super professionals will run in a 10mm heel drop shoe. I thought all of them like the flat one racing type of shoes? Yep, this is the Streak 3. Dathan Ritzenhein has actually stated that the Streak XC is not enough shoe for him for a marathon. And many Brooks athletes (including Olympians Desiree Davila, Amy Hastings, and Brian Sell) are/were road racing in the 12mm drop T7, so the Streak 3 isn't even the highest. To tell you the truth, the pros I've talked to don't concern themselves with numbers like heel-toe drop, they look at fit and ride.